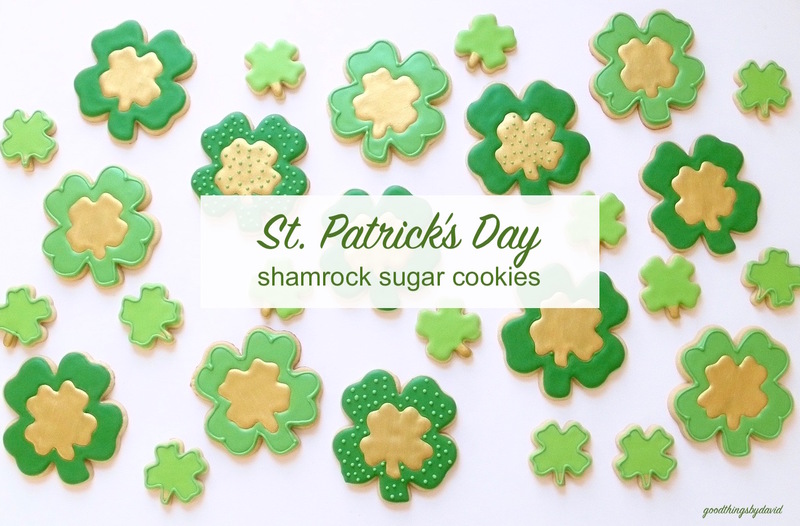 Sugar cookies in the shape of four-leaf clovers are a festive way to celebrate St. Patrick's Day. This year I was so happy to make several dozen for folks around town, especially after having spent days without being able to bake. With a couple of batches of sugar cookie dough and some smooth royal icing, I set about gilding and icing some pretty shamrocks, for a little bit of that luck of the Irish. 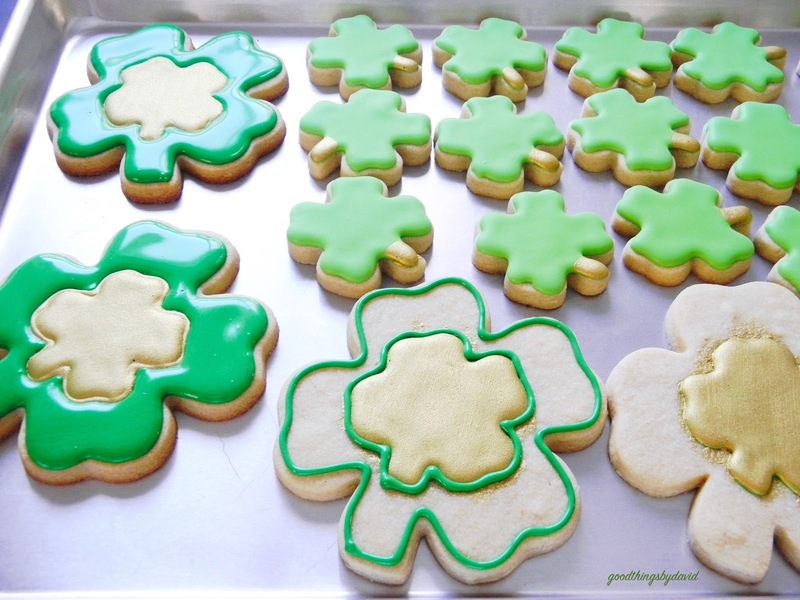 The brand new shamrock cookie cutters (proudly made in Missouri!) that I purchased on eBay, make beautiful cookies. The largest of the cookie cutters create a very generous sugar cookie, while the smaller ones make tasty mini bites. After cutting out the large cookies, right before baking, I used the smallest of the cutters to score the dough in the center. The impression of the small, four-leaf clover was etched onto the surface of the cookies as they baked. This made it easy to ice them. Three shades of green royal icing were used for this project. You have to have a little gold on St. Patrick's Day! Outline and flood the centered shamrock in any of the green royal icings. Let the icing dry completely. Mix unflavored vodka with tiny amounts of gold cake decorator's highlighter until you have a smooth paint color; add highlighter to a small bowl, and slowly add the vodka, drop by drop. 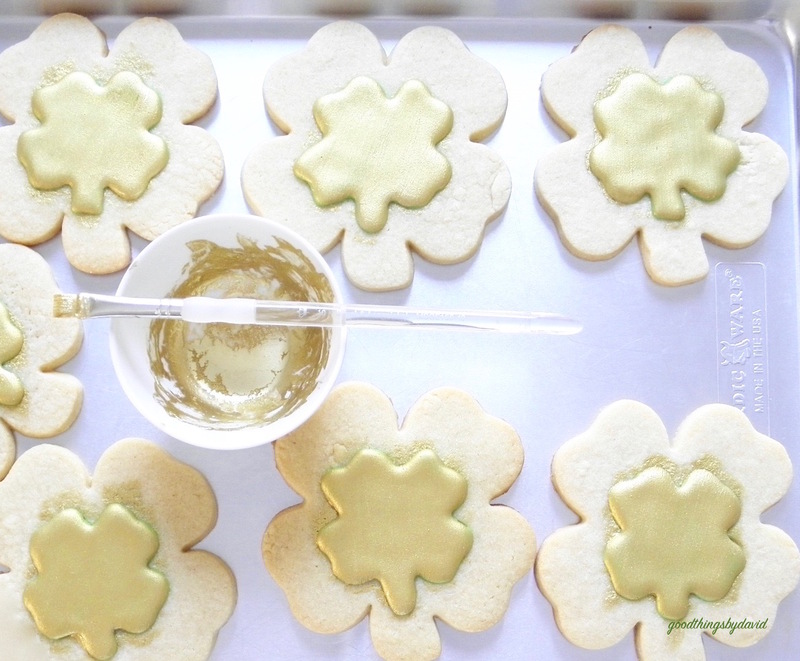 Using a fine paint brush, apply the highlighter onto the small shamrocks as shown. These cookies might take 3 coatings of the highlighter before they are picture perfect. Let each coat dry completely before giving it another go. Note: don't worry if you get highlighter onto the negatives of the cookies. These are going to be covered in royal icing. 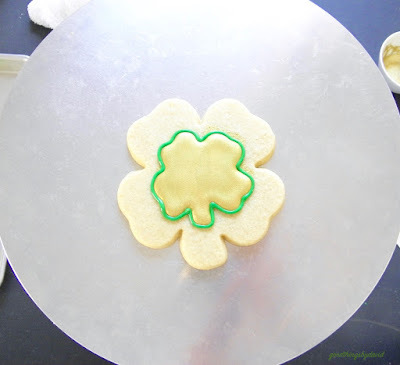 After the gold shamrocks have dried completely, use green royal icing and a #4 piping tip to outline each shape. Outline the perimeter of the entire shamrock using the same royal icing. 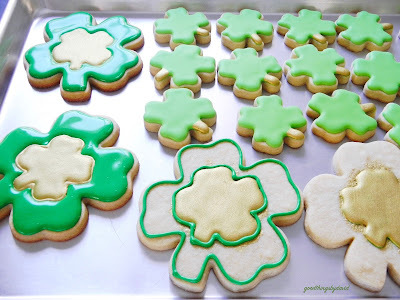 Immediately flood the shamrocks in the green royal icing until they have been filled. 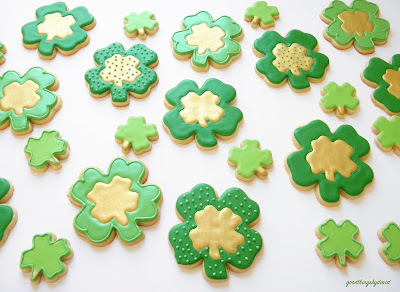 Proceed with the rest of the cookies until you have a variety of shades of green. Let the cookies dry completely. It's up to you whether you want to go back and add a bead of icing to create borders on your cookies or dots where you see fit. I made a variety so that people could choose what they wanted. Don't let St. Patrick's Day pass by without making some shamrock cookies. You can quickly make dozens of these for your friends, family and neighbors, or for a birthday party. 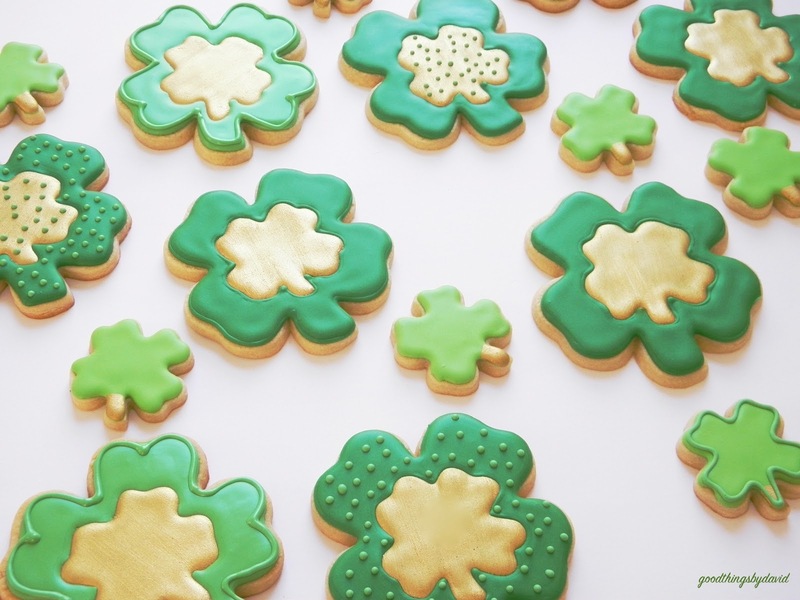 Gild them, ice them and then devour at least one cookie on St. Patrick's Day. 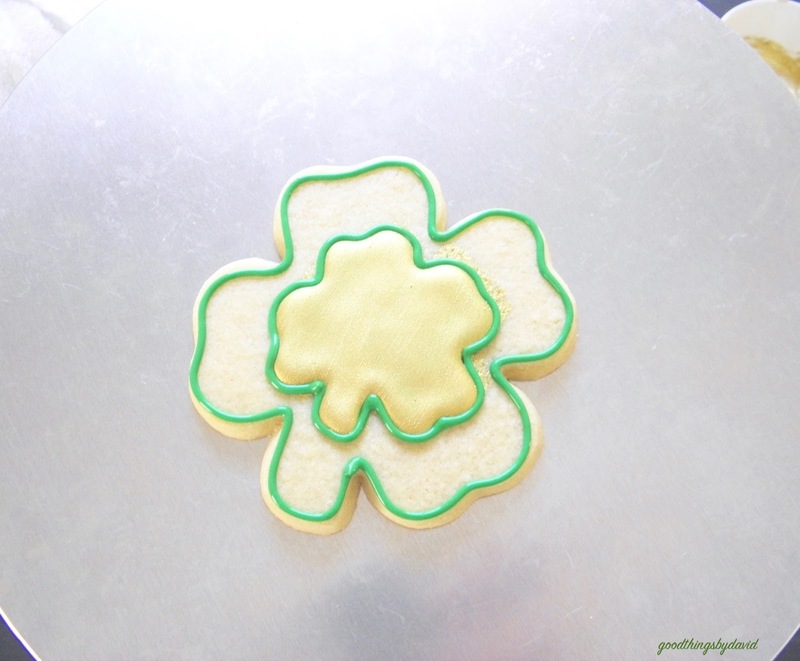 A Shamrock Sugar Cookie will probably bring you some good luck!